What does SEER Rating Mean? | Bloomfield Cooling, Heating & Electric, Inc. The bare minimum SEER rating for residential Air Conditioning sold in the US is 13 SEER. However, this only came into effect in 2006, so your current Air Conditioning unit may be rated lower. To be energy star rated an Air Conditioning must be rated 14 or above. 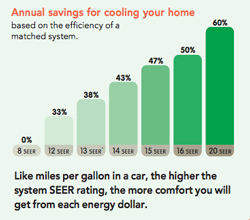 Upgrading your unit increases your SEER rating, so you can watch the savings quickly add up. For example, if you upgrade an Air Conditioner that is rated 9 to one rated 13, the power consumption is reduced 30%. Over time this can lead to $300 in savings per year (depending on your energy costs). This entry was posted in Air Conditioning and tagged Efficiency, Savings, Seer by Brianna. Bookmark the permalink.